On Friday a gave the first of my own contributions to a short series of classes for the evangelisation team gathered by Fr Stephen Langridge at the Vocations Centre at Whitstable. These are young men discerning their vocation, living in community at the centre. They have a programme of prayer (morning meditation, Mass, Rosary, visit, Office etc.) 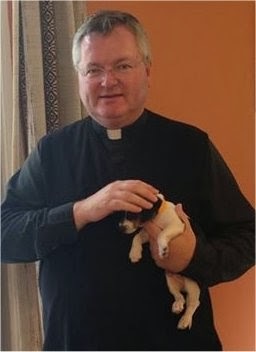 they do some manual work around the house and grounds, and, most importantly, engage in evangelisation in various ways in chaplaincies and on the street. 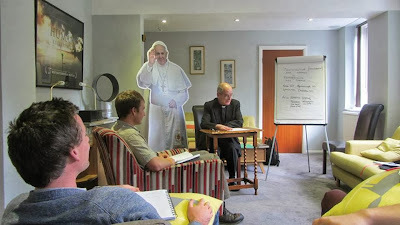 The idea is that evangelisation should be part of the "DNA" of those considering priestly formation. On Friday I was introduced to the community dog. He is called Nemo and it was explained to me that the name is itself instructive because it indicates that he is not a person. I was also introduced to the cardboard cut-out of Pope Francis. This is used in an ingenious idea for evangelisation dreamt up by the team. They take the cut-out onto the streets and invite people to have a photo taken with Pope Francis. Since the Pope is very popular and has had good press coverage, this is an amusing prospect for people, and an opportunity for the team to engage in further conversation about the faith. Unfortunately, the maker of the cut-out could not find a full-length photo of Pope Francis at high enough resolution, so it is cleverly photoshopped with the top half being Pope Francis and the bottom half being Pope Benedict. Keen-eyed readers will spot the error here, since it appears as though Pope Francis is wearing red shoes and has Pope Benedict's arms on his fascia. I hope he doesn't mind too much - the people on the street will not notice. Please pray for the work of the Vocations Centre, and for vocations to the priesthood. There is a special Help page if you would like to support the work, as well as an amazon wishlist in the sidebar.